Writing about Joan Didion can seem superfluous; after all, it is Joan Didion who has written most widely about Joan Didion. Perhaps more than with any other author, Didion’s personality is impossible to separate from the pages of her work. In five novels, three memoirs and an expansive collection of essays, Didion’s character drips from each precisely positioned word. This is not only a matter of style—her remarkable sense of rhythm, her incantatory repetitions of phrase, her famed lack of sentimentality—but it is the way readers can sense her world view forming and reforming each time she commits her thoughts to paper, the way her understanding of herself is inextricable from her understanding of her subjects. Her oeuvre has, over time, become a map of her subjectivity, the location of each idea or event subtly repositioned in every piece of prose. Didion’s writing of the self is far removed from the brand of memoir we are familiar with today. Didion was born long before social media and reality TV began encouraging the masses to narrativise their lives, and her sensibility is at odds with the salacious tell-all or the voyeuristic confessional. Hers is more a brand of emotional honesty: sometimes brutal and always piercing enough to scar. Unlike many of her New Journalism contemporaries, Didion is willing to remain an observer in her essays. Her greatest strength, she has maintained, is that she is ‘so physically small, so temperamentally unobtrusive, and so neurotically inarticulate that people tend to forget that [her] presence runs counter to their best interests’. What she offers is an ability to examine the patterns of her own thinking ruthlessly, the intellectual trajectories through which she develops her conception of the world. This technique teeters on solipsism, yet Didion has always retained an uncanny ability to locate herself and her subjects in a narrative of society more broadly. 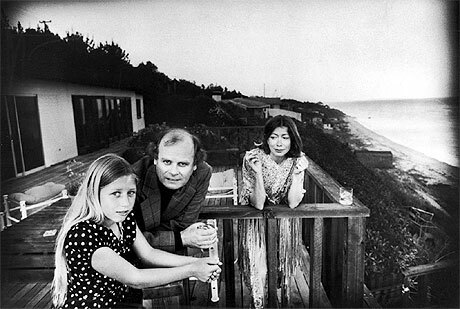 After her last two memoirs, 2005’s The Year of Magical Thinking and 2011’s Blue Nights (which deal with the deaths of her husband John Gregory Dunne and her adopted daughter Quintana respectively), critics began to question the candour for which Didion had previously been acclaimed, accusing her of voyeurism and even exploitation. One reviewer described having ‘ethical misgivings’ with Didion laying bare her public eulogy in Blue Nights—as if this most unbearable of tragedies is in a sense indescribable, as if the experience of mourning is inherently private and should remain so. In these two works, Didion’s oft-quoted maxim that ‘writers are always selling somebody out’ has been curiously inverted. In sharing what is perhaps life’s greatest tragedy, is Didion now selling out herself? Quintana experienced a string of ups and downs in the subsequent months. Didion told her of Dunne’s death when she awoke from the coma in mid-January, but she had to be re-informed and re-experience the initial shock again several times in the weeks that followed. They waited until Quintana had recovered sufficiently before holding Dunne’s memorial service. At this time, she seemed to be on the mend and flew with her husband Gerry back to Los Angeles to begin her recovery. But on the walk to the car park she collapsed, the description of her fall much like that of Dunne’s death. One second Quintana was talking, then she wasn’t. She had been struck by a hematoma, the cause of which is still unknown. She was on medication that could have caused the blood clot in high altitudes, but some also suspect she may have been drinking on the plane. (Quintana had experienced problems with alcoholism throughout her adult life.) She required six hours of brain surgery. Most readers come to Didion’s work through her 1967 essay ‘Slouching towards Bethlehem’. Harnessing the dread that permeates W.B. Yeats’ poem ‘The Second Coming’ (from which it takes its name), Didion’s prescient piece captured the mood of the late 1960s long before flower power had wilted. Struggling to elucidate the unease she felt, Didion travelled to San Francisco to hang out with the generation that had turned on, tuned in and dropped out. What she discovered was a league of lost children not amid a social revolution but rather in a drug-addled stupor—consumed by a self-destructive nihilism and lacking the language to articulate their particular malaise. The haunting image that concludes the piece, of a five-year-old girl whose lips are so parched she appears to be wearing white lipstick, who happily informs Didion she is in ‘High Kindergarten’ (her mother has been feeding her acid and peyote for a year), is impossible to erase. Like much of Didion’s work, the anxiety that permeates this essay was not only political but also deeply personal. She was suffering at the time her own crisis of faith, struggling with the purpose of her writing. ‘All that seemed clear was that at some point we had aborted ourselves and butchered the job, and because nothing else seemed so relevant I decided to go to San Francisco,’ she wrote. She later admitted that image of the young child had compounded her concerns about her own mothering skills. Didion had adopted Quintana the year before, and feared similar neglect in leaving Quintana in order to research the piece. And like all the essays in her first collection, this story was, for Didion, emblematic of the shifting values of a contemporary California—a sun-bleached land that spoke of new beginnings, but one forged in the bloody frontiers of the westward advance. Didion was born in 1934, the first child of Frank Reese, Eduene Jerrett Didion—and the Sacramento Valley. Ever frail, Didion has always looked as far removed from the bronzed Californian type as imaginable, but it is to the country of her childhood that she has returned again and again in her essays and her fiction. Until very recently, Didion’s family had remained absent from her writing except for brief allusions, her history instead explored through the mythic landscapes where she was raised. In ‘In the Islands’, an essay taken from 1979’s The White Album, Didion discusses the writer’s relationship to place. ‘Certain places seem to exist mainly because someone has written about them,’ she says. ‘Kilimanjaro belongs to Ernest Hemingway. Oxford, Mississippi, belongs to William Faulkner … A place belongs forever to whoever claims it hardest, remembers it most obsessively, wrenches it from itself, shapes it, renders it, loves it so radically that he remakes it in his image.’ If this is the case, then California certainly belongs to Joan Didion. The story of the Donner–Reed party has long captivated Didion, and she returns to it again and again as a defining symbol of California. The group of eighty-seven pioneers set off from Illinois to California in 1846, but were forced to camp in the foothills of the Sierra Nevada when they were hit by a sudden blizzard. Trapped and faced with starvation, they ate their own dead, and only forty survived. Didion’s great-great-great-grandmother Nancy Hardin Cornwall had set off with the party from Illinois, but left them at the Humboldt Sink in Nevada to go north through Oregon. For Didion, this event encapsulates the dark side of California’s ‘unfettered individualism’, an act that poisons the ideals to which it was committed. The frontier ethos may be black and white, as clear-cut as life and death, but California itself remains a ‘wearying enigma’. Her first novel, Run River, published in 1963 when Didion was twenty-nine and working as the features editor for Vogue in New York, stemmed from her homesickness for the California she loved. ‘I sat on one of my apartment’s two chairs and set the Olivetti on the other and wrote myself a California river,’ she recalls. It is the story of Lily McClellan, the wife of a hop grower on the Sacramento River, the first of Didion’s protagonists who at least in physical appearance so closely resemble her. (Lily’s demeanour is described as a ‘striking frailty’.) The same can be said of Maria, the heroine of her second novel, Play It as It Lays, who suffers from hereditary migraines like Didion does. Set in an amoral Hollywood, the characters’ values (or rather lack of them) are far removed from Didion’s unequivocal ethics. Written when she and Dunne were living in Hollywood and working as screenwriters, Play It as It Lays, like all Didion’s novels, represents what she once described as ‘cautionary tales’. The tragic lives of these fragile women are the ‘stories I don’t want to happen to me’. In ‘The White Album’, the title essay from her second collection, Didion reveals just what her experience of the Haight-Ashbury neighbourhood in San Francisco was a precursor for—events such as the Manson murders and, most shockingly, the confession that ‘no one was surprised’. Here, too, this sense of societal panic cannot be separated from Didion’s own mental state. She infamously included a transcript of her psychiatric report that described ‘a personality in process of deterioration with abundant signs of failing defences and increasing inability of the ego to mediate the world of reality and to cope with normal stress’. She details what are now mythic events in American history in an attempt to make sense of the incomprehensible world around her. The arrest of Huey Newton, watching Jim Morrison record in the studio, visiting Linda Kasabian in prison—these vignettes are interwoven with Didion’s mental decline. As she proclaims in her opening sentence, ‘We tell ourselves stories in order to live’. Or more to the point, ‘cautionary tales’ that tell us how not to live. Many of her essays can be linked to her ideas of California—her fascination with the meaning of water in ‘Holy Water’ and ‘At the Dam’, her wistful descriptions of a changing California in ‘Some Dreamers of the Golden Dream’, ‘John Wayne: A Love Song’ and ‘James Pike, American’—yet it is not always easy to pinpoint why Didion is as uncompromising about certain subjects as she is. In ‘The Women’s Movement’ she derides contemporary feminism as ‘a particularly narrow and cracked determinism’, yet in an essay on painter Georgia O’Keeffe praises her for her ‘hardness’ as a ‘guerilla in the war between the sexes’. While she remains transparent about herself, her attitudes towards her subjects are at times oblique. It was during her years in New York that Didion met Dunne, then an ambitious young writer at Time magazine with whom she developed a strong working friendship. Dunne corrected the galleys to Run River. In 1964, around the time she and Dunne married, Didion suffered her first nervous breakdown. In ‘Goodbye to All That’ she describes it also as a crisis of faith—that ‘everything that was said to me I seemed to have heard before, and I could no longer listen’. After their marriage in January, Dunne suggested in April that they go to Los Angeles for a few months. They stayed there for twenty years. The details of their relationship described in The Year of Magical Thinking come as something of a revelation. For all Didion’s writing about her experiences, John and Quintana are curious absences in her work, almost tangential characters in the life narrative she has constructed. There is a passage in The Year of Magical Thinking that describes an evening in which she and Dunne are sitting at home, John rereading a passage from her third novel, A Book of Common Prayer, to see how a sequence worked technically. He shuts the book and looks at her. ‘Goddamn,’ he says. ‘Don’t ever tell me again you can’t write. That’s my birthday present to you.’ The two worked from home, co-wrote scripts for several feature films, including The Panic in Needle Park and Up Close and Personal, and were each other’s lifelong editors. Knowing Didion’s ongoing doubt about her ability, one cannot help but be struck by the pure romanticism of that scene. In 1966 the couple adopted a baby girl whom they named Quintana Roo after the Yucatán Peninsula territory, which was at that time a terra incognita. Perhaps the quintessential photo of the three is one taken in 1976 on the deck of their house in Malibu. Didion is fresh-faced and beautiful, leaning on the sea-worn wooden rail with a cigarette in hand, gazing at the young Quintana. Dunne looks out of place, his tweed jacket and balding crown incongruous in the Malibu sun. Quintana is the only one who looks really at ease—a golden child of the golden land, her long hair sun-bleached, her honey skin so unlike that of her adoptive parents. And yet this image of Quintana is so at odds with the child Didion describes in Blue Nights, she of the quicksilver moods. It is as if Quintana haunts her prose, a spectre oscillating between presence and absence whom Didion can never quite speak of. In The Year of Magical Thinking we are given the details of Dunne’s death in the opening pages. She wrote it only eight months after the event. It took her five years to write about Quintana, and even now it is as if Didion cannot find the right words to convey its tragedy. There is the line she returns to again and again: when we talk about mortality we are talking about our children. But although Blue Nights professes to be a book about Quintana, it is not. When I think of Joan Didion, I recall the photo on the cover of The White Album. She’s leaning out the window of a white convertible, head slightly tilted, staring straight at the camera. She is effortlessly cool, her gaze bearing the nonchalance and hint of melancholy her prose would suggest, a rolled cigarette held between her spidery fingers. Didion’s appearance—her pale-as-paper skin, her insect-like limbs, her flat brown bob—never quite matched the California she loved, nor the sharpness of her prose. Perhaps the only hint of Hollywood, where she lived and worked for many years, is her oversized dark sunglasses, a trademark that does not belong to a starlet but rather to a woman with self-confessed ‘bad nerves’ trying to block out the world. The strange thing is that Didion now, the woman of constant sorrow, is not very different to the Didion of her youth. Despite a more severe angularity, her brown hair now turned grey, the woman of seventy-five is not much different to the one she was at thirty. And yet perhaps this is what makes the passages in Blue Nights in which she describes being forced to take stock of herself after having a fall all the more brutal. A doctor tells her she ‘has made an inadequate adjustment to ageing’. ‘Wrong,’ she replies. ‘In fact I have made no adjustment whatsoever to ageing.’ It is as if Didion’s ever-frail body is finally concordant with its age. In The Year of Magical Thinking, Didion discusses the way literature has always been a source of solace. ‘In times of trouble,’ she writes, ‘I had been trained since childhood, read, learn, work it up, go to the literature. Information was control.’ She reads the journals of C.S. Lewis after his wife’s death, Thomas Mann’s The Magic Mountain with its descriptions of Hermann Castorp after his wife’s demise. She devours Freud’s work on mourning and melancholia, building up the medical vocabulary to describe her own symptoms. She may be in the midst of what she terms ‘magical thinking’—she refuses to throw out Dunne’s shoes in case he comes home, insists on an autopsy so the doctors can prove he’s still alive—yet she has the knowledge to understand it, the language to articulate it. This is what makes her fear of never again being able to find the right words in Blue Nights all the more heartbreaking. Information was control, and she may be losing it. The Year of Magical Thinking and Blue Nights stand together like a compendium of Didion’s grief, their styles identical—the same strong sense of rhythm, their use of italics and repeated phrases, the fine balance between the weight of emotion they carry and the at times clinical nature of the prose. The images of one flow through to the other, as if for Didion no time has passed in the six years between their publication. Didion does not deny the ongoing nature of grief. This is not a battle to be won, a struggle to be surpassed. It is not until near the end of Blue Nights that Didion reveals Quintana has been dead five years, and yet her thoughts of her remain overpowering. There is more potency in the declaration ‘I need her with me’ than anything more sentimental could conjure. The rhythms of her prose, its ebbs and flows, its repetitions, mimic the processes of memory. In an interview with Sara Davidson she describes how this technique evolved, that ‘it seemed constantly necessary to remind the reader to make certain connections. Technically it’s almost a chant. You could read it as an attempt to cast a spell or come to terms with certain contemporary demons.’ And yet the ghosts of John and Quintana are demons Didion can never exorcise, and she doesn’t try. As she writes towards the end of Where I Was From, ‘there is no real way to deal with everything we lose’. In Blue Nights she is no longer commenting on the nature of grief, but rather detailing the throes of it, an experience that can be extremely uncomfortable for a reader. What lies at the centre of Didion’s widening gyre has always been Didion herself, at once Yeats’s lost falcon and beckoning falconer. For an author who doesn’t know herself until she puts pen to paper, it is hard to imagine a more reticent way to live—she writes to discover who she is, to mediate between her fragile ego and the outside world. But in Blue Nights there is an overwhelming sense of finality. The day Didion understands herself is the day she stops writing. I don’t know which is the most unbearable conclusion to draw from Blue Nights—that she may never write again, or that she may die before her life’s truth is revealed. Writing The Self: On Joan Didion was published in Meanjin #2 2012.